Millions of devotees are expected to flock to Quiapo Church tomorrow, January 9, 2012, to participate in the annual procession for the much-venerated Black Nazarene. As GMA News reported, hundreds of devotees have already flocked to the Quirino Grandstand in Luneta for the ‘Pahalik’ tradition as early as Saturday night. In line with this, the Far Eastern Univeristy has announced that for tomorrow, classes are suspended while the offices are closed “except for Facilities and Technical Services to be manned by a skeletal force,” the university noted in a brief statement published on its website. At least two universities, the Polytechnic University of the Philippines and University of the Philippines – Manila, announced that classes would go on as usual despite the Black Nazarene feast. The PUP made the declaration on its Facebook page while the UPM broke the news via Twitter. Last January 5, the Department of Education the cancellelation of classes on the schools located along the route of the procession of the Feast of the Black Nazarene to “ensure the safety of pupils and students”: Apolinario Mabini Elementary School, Geronimo Santiago Elementary School, and Ramon Avanceña High School. 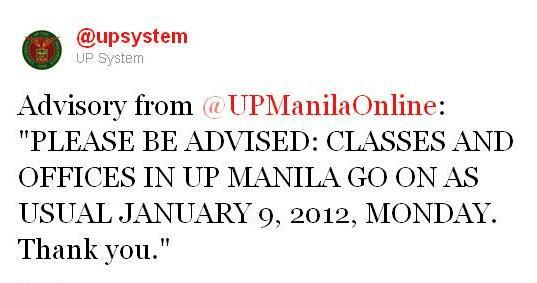 Regular classes will resume on January 10, 2012. As of this writing, the University of Santo Tomas is yet to make an announcement regarding a class suspension. This writer called the university a few minutes ago, but was told that no memorandum regarding the matter has been released. Students are hereby advised to call the school at 406-1611 early morning tomorrow to confirm.